We left Amanda and Darrens D.I.Y Dream Day with Amanda about to enter into the ceremony room… Well let’s see what happened next, from the I do’s all the way to the D.I.Y party. The magic picture box is once again is in the capable hands of Absolute Photography. The music started and in walked the bridesmaids. Not how I had imagined them to walk in but at that point it was fine! Then it was my turn. I felt a bit sick, but I had my Dad. I looked around at all the faces and caught sight of Portia already in tears; I took a deep breath and held the tears back. I saw Darren and could instantly tell he was super nervous, but playing it cool while he waited for me (he didn’t know that I’d nipped to the ladies!). The ceremony was lovely, my twelve year old brother did two readings, I was so impressed by his confidence he read them so well and as he’s dyslexic it was even more impressive. 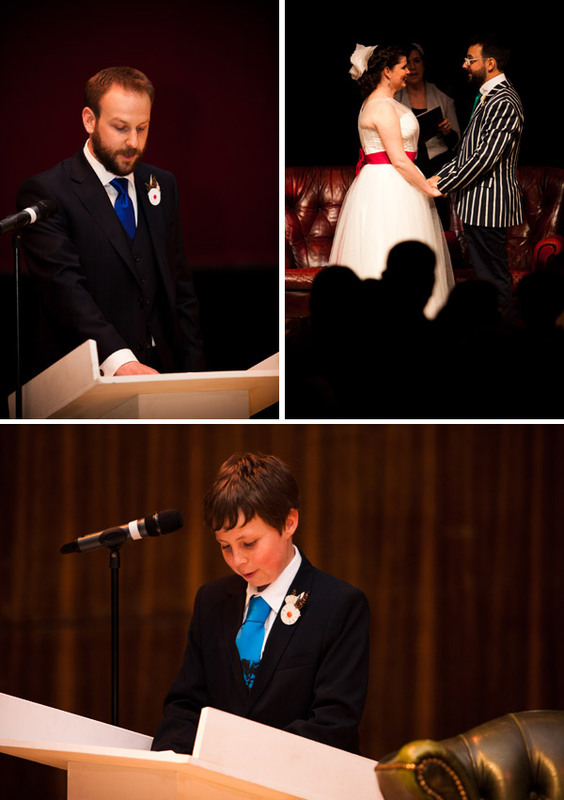 Darren’s groomsman Nick also did a lovely reading which he selected and edited himself from the movie Stardust. He was really nervous too but did us both proud. Then it was time for the legal bits, do you take…. At this point I was asked if I Amanda Georgia Champness took Ross… err no she didn’t!… The poor register had asked if I would like to take Darren’s best man! She looked SO embarrassed but it was funny and at least I said Darren! So we gave each other our beautifully hand crafted completely unique rings a wedding present from my friend Alison who had made my engagement ring, so they matched. Most of all I promise to love you until the end of time, forever and for always yours. So we signed the register and that was it we were husband and wife. 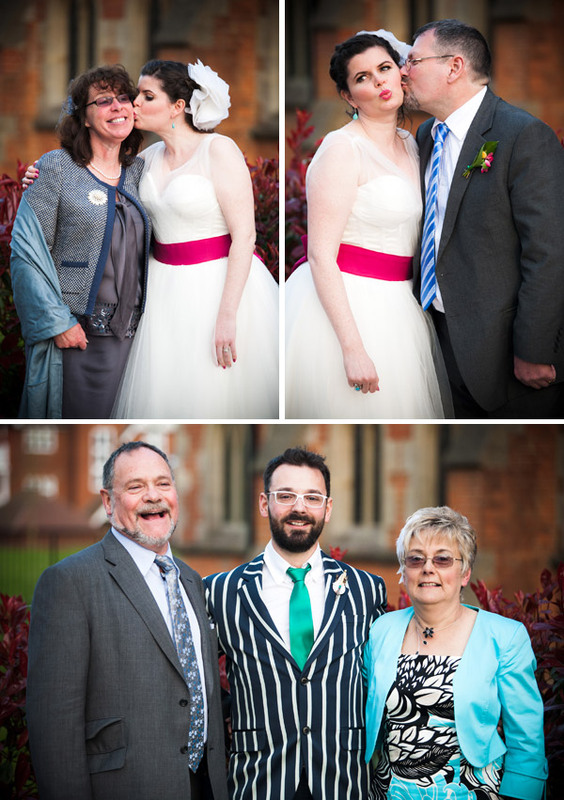 Once we’d got outside the theatre into the foyer, an unplanned receiving line occurred, which was lovely as we were both able to hug and kiss everyone that had just witnessed our wedding. Up to the roof top we went, for group photos and bubbles. I thought at this point there were still ages to go. In fact the bus was waiting and we had 20mins. So a lot of the group photos we had planned were missed out, which is a shame as I have no individual bridesmaid shots, something I hadn’t really considered. Once everyone had got on the bus, we stayed behind with Dan, Leah and Rosie and had our own little photo shoot. This was SO much fun! And the photos ARE AMAZING! Dan had borrowed a tilt-shift lens especially for our wedding which is why some of the photos have such an amazing look to them. We pranced around all over the shop and I LOVE the fact that I have wedding photos of us in an art installation, as I’m an installation artist. These are some of my favourite wedding pictures, although it would have been amazing to have seen the guests’ faces when they walked into the reception. It was reported back to me that there was many a gasp and ‘Wow’s’. They were greeted with a jam jar of G‘n’T by my lovely ex-student Daisy. When it comes to the reception venue, with all our DIY creations I was really happy with how it all looked. However not wanting to be negative in my wedding report I shall stick to a ‘NO COMMENT’ on service and food. 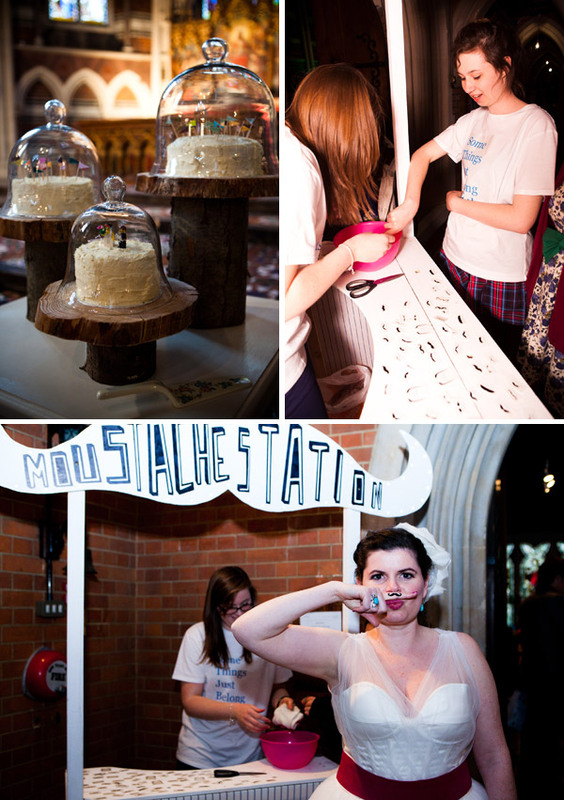 Once dinner was over, evening guests quickly started to arrive and we unveiled the secret use for the Moustache Station! We had Anna and Charlotte some more ex-students (sometimes its handy being a teacher!) apply temporary tattoo’s of moustaches to people’s fingers! Fingertashes! You can get them in Anthropologie (Or from me! Yes I’ll reveal that at the end!) Once people started seeing them they were everywhere, some kids even had them actually applied to their faces as moustaches! Once most people had arrived we started with the speeches. We wanted to save them for the evening so that everyone could enjoy them, plus I wanted a bigger audience for mine. My Dad started and did a short but sweet speech; it was lovely that he thanked my Mum and step-dad for doing a good job with me. But he did a great job too! Then untraditionally Darren’s Dad had asked to give a speech and what a marvellous job he did! He was so well prepared and had props and everything! He said some really lovely things and my favourite line from his speech was, ‘as there hands met reaching for the craft glue’. Then it was my go, now as a teacher, an ex pub quiz reader and general lover of attention I love a bit of public speaking, strange I know! But I really wanted to thank certain people and I think it’s actually quite a powerful way of doing so. I thanked SO many people but I really wanted to thank my Mum, she’s done so much for me and never really listens when I tell how great she is. Well I got her good this time. She cried some big tears and so did a few other people I hear. At the start of Darren’s speech he even got heckled by my step-dad saying that he’s got a tough act to follow. But this is why I picked Darren. He follows this mouthy lady with no concerns. He did a wonderful speech that had everybody laughing. At last it was the best mans turn, Ross did an amazing speech at his own wedding just the year before, so I knew it would be great. It was so well planned; he had prepared cards to read it from with the pictures of Darren and I, from our invitations. And had even themed his speech around our wedding theme of ‘Some Things Just Belong Together’, I was so impressed. He was actually a god send on the day and was the bestest best man ever! Ross finished his speech to a loud round of applause and introduced our first dance: Edward Sharpe and the Magnetic Zero’s: Home. I love dancing with Darren; we had considered planning a dance but never really got around to it. But we have some moves of our own, so much so that a lot of people had thought we had choreographed it. Once we finished dancing to Home, our magnificent band Lady M and the Mr Men got straight down to some AMAZING music! THIS BAND IS WORTH EVERY PENNY. They were SO kind and so warm and generous and they even danced in their break! They were truly awesome! Ok do you get it? I loved them!!!! In fact everyone did, we still get comments every time the wedding is brought up, about how great they were! 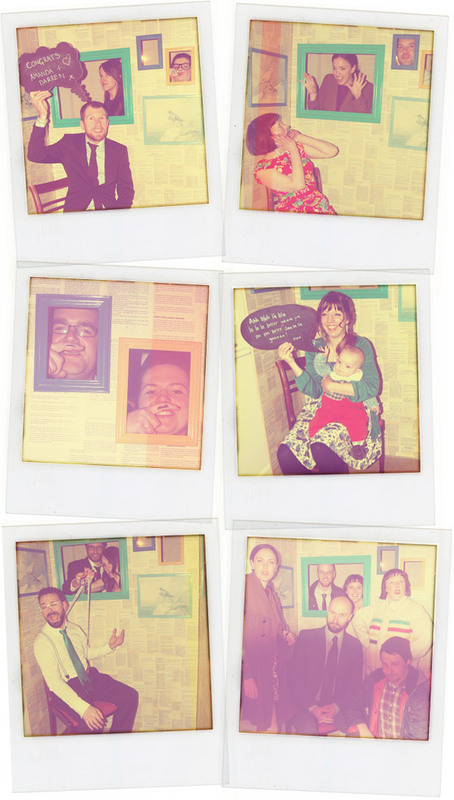 By this time the photo booth and moustache station was in full swing, the cookies were being munched on and most people were dancing. I danced ALL night in fact I think I only left the dance floor for two reasons: 1. to pull other people on to the dance floor 2. To use the bathroom! During the bands break, Darren came on and sang a song for me accompanied on guitar by his friend Phill. It was a variation on a song by The Devine Comedy that he had rewritten and practiced only a few times in the week before. You can see it at the end of our video, if you dare! You can see the video at the end of my report, it’s great don’t you know! It truly was a wonderful day and night. think about what you wear whilst you’re getting ready. NO-ONE told me that my vest was see-through. Hence no below the bust shots of me getting glammed up. be pedantic with your suppliers – don’t be afraid to be precise, I took it for granted that some of our supplier’s would know exactly what I wanted and a lot of the good ones did. However I wished I’d been more precise with the fine detail. think about the photos you really want and make a precise list, start NOW. Dan did an amazing job and asked throughout the day if there was anything else I wanted photos off and every time I said no. However I had no individual shots of my bridesmaids and a few DIY’s where missed of the photos, luckily a photographer friend captured most of them. think about who you ask to be in your bridal party. What friends can and will do is very different from what you might like them to do. make your mind up as soon as possible. I could decide on a design for Order of Service, so we didn’t have one and I wish we had. Also if I’d picked our theme a lot sooner it would have been easy to choose items. Oh and put a sign on your evening favours, we had magnets of our invitation, illustrations and now one took them! Well I’ve created Doris Loves which is a hire business from which I shall be hiring lots of the goodies that I made for the wedding including the chair covers and moustache station. The range will increase as things develop and as well as offering a custom service too, so let me know if you have any crazy ideas that we can make for you! We’d also love to have a baby ASAP, so watch this space! Apart from that we’ll continue to enjoy each other, and our growing collection of pets, we’re on three chickens and two cats at the moment! Apart from that I’d like to take this final space to thank the other real brides who have been so supportive to me, answering questions within minutes and a generally been a god send. So, thank you ladies! And thanks for reading this epic post! It’s taken quite a while but I hope it was worth the wait! So there we have it ladies and gentleman. Amanda and Darren are two of the nicest people you are ever likely to meet. They truly deserve each other and all the hapiness in the world. Team RMW wish you both the best of luck with all of your future plans (they sound mighty exciting). It seams like they have started off on the right foot. The reception party looks immense – a complete hoot. Those tilt shift images of the church are super cool – I love how they make everything look like little minature models. Right, Im going to pop over to Doris Loves for a few packets of moustaches! Oh, and as promised – here is the video of Amanda and Darrens D.I.Y Dream Day. Prepare to smile. Amanda, you’re such an inspiration to everyone out there who is having / wants / needs to have a budget or DIY wedding. 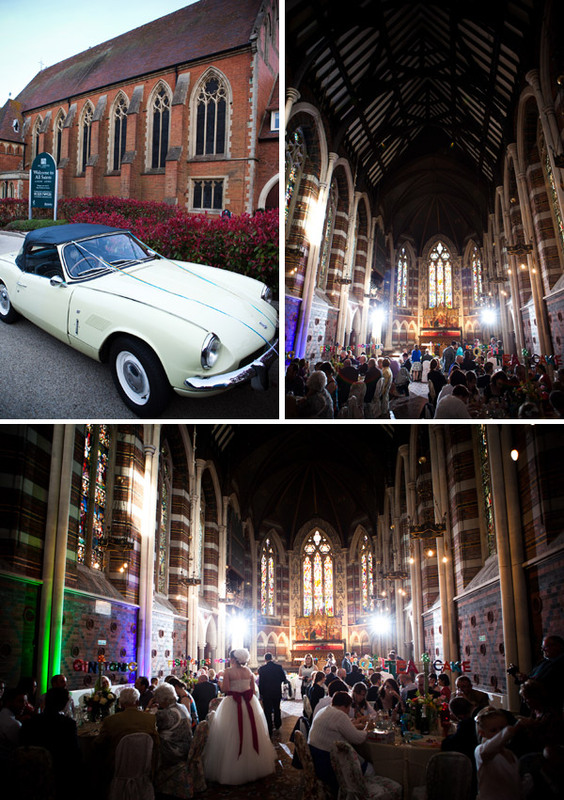 Everything you’ve done looks amazing and still retains your quirky personal touch which makes your wedding so YOU. And on top of all that, you’re a seriously lovely lady. I’m now trying to think up potential parties which may be in need of a moustache station and an Amanda! Probably my fave real wedding ever! 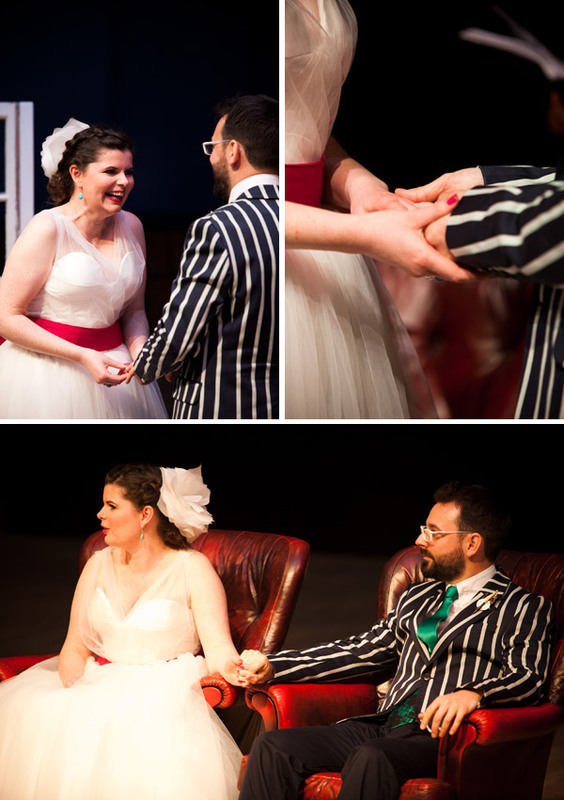 Amanda – those vows almost made me cry into my porridge. A real inspiration and so heartfelt. We’re writing our own vows too and now I know thats the right thing to do for sure! My other favorite thing – the music. ‘Home’ is one of my all time favorite songs and the Divine Comedy my all time favorite band! When I was a teenager I wanted to marry Neil Hannon…. I was bopping around the kitchen watching your video. Lovely touches and you are the DIY queen but the real stand out for me was the feeling of everyone having such a good time, regardless of the pretty. Aww that was such a heartfelt report – loved reading every bit of it! You were so lucky to have such a wonderful sunny day, the light in your outdoor photos is just fantastic and make everything look so bright and full of colour! My favourite photo has to be the one of you and your bridesmaids doing the conga line – great shot! I got up extra early to view Part 2 of this wedding – it looks like so much fun and its great to see how it all came together after reading all the posts over the last few months! Still not over the genius of a tache bar. Those vows are AMAZING. Did you write them or ‘borrow’ them? Did you both say the same thing or did you say different? This made me cry. I dont know you guys but you can tell just by looking that this really was YOUR day, and it was done YOUR WAY down to a T.
Congratulations, and good luck with the baby plans!! I love your photos! They are soooooooo immense it’s untrue! You look like the happiest woman in the world and rightly so! Your video is amazing, and moving and what a fantastic memento of your day! Serious regrets over here about not having one. I can’t wait to hear news of a babymanda! I know we will keep in touch via our club but I am so sad not to be reading your posts on here anymore. Let’s hope we all meet up again as soon as everyone is wedded up!! Your venue actually looks like something out of a dream and your dance moves are soooo groovy baby! Having watched that video I can confirm that I am in love with you both. Such silliness and fun and oodles and oodles of love. Your venues are amazing and your moustache bar is pure genius! It has been lovely reading all your posts and wish you & your hubby (eeeee you’re a Mrs!!! 🙂 ) all the love and happiness in the world. Make sure you let us all know when baby Amanda arrives!!! Thank you all for the very kind words, I’ve got to run of to Brighton to go and get some material for my first Doris Loves commission that I think you’ll be hearing all about shortly! But I shall come back and answer the questions this afternoon!!! Amanda your wedding looks like such absolute fun, what an amazing day. Okay so I MIGHT have had a wobbly lip at your vows, I’m scared to even suggest Lee and I write our own cos they’d just end up being rubbish – your words are beautiful. The roof shots I love!!! Reminds me of Empire Records. What an amazing fun wedding! I love that the registrar got the names mixed – like a Friends moment but the good kind! I love the moustache station, and I have to ask – what is this wonderous G&T bar thats being referenced? It sounds incredible! CONGRATULATIONS Amanda and Darren. You worked sooo hard for what looks like a wonderful day. Gorge photos and fabulous video which made me laugh and cry. I thought I’d have a quick peek at the video and ended up watching the whole thing with a big fat smile on my face!! Such a fun day packed with laughs and some really nice emotional bits too! I am loving those screen printed ties… definitely going to be looking into getting one of those. We will miss you Pet. Lots of love and luck to you Darren and Doris Loves! Here am I back again to say some more personal thanks and answer some questions! Sorry it’s taken SO long to get back to you! @Shirley thank you SOOO much, you have been such a support to me and the others!!! ANd I’d love to come to a party and apply temporary tattoo’s to your guests!!! @Inbal Livne I am honored to be your fav! Although I’m sorry to have made you cry into your porridge. And do write your own vows! As it will highlight the special quality’s to your partnership! @Fiona M the scaffolding is actually a part of a firework installation! Crazy! As for the lego, we had to specially request a head for Darren that had a beard and glasses, they had to go into the store room to get it! Totally worth it! @Kitty glad you enjoyed the report it was surprisingly hard to write! We were very lucky indeed to get sun as it had been raining ALL week!!! Thanks for your wishes for us! @Sam B the venue was amazing looking indeed! Thanks! @Lizzie thanks for getting up early for the big part two! Of course I don’t mind you asking a techie question I’m happy to help! So we actually hired an ex-student of mine to come and help and take the photos, as I too was worried about the camera and wanted to insure that there was photos taken. However, the photos very extremely heavily edited because our lovely girl maybe got a bit distracted and maybe wasn’t confident enough to ask people to join in to. Long story short I would highly recommend finding your local uni and asking a photography student to do it for you for £50-£100 it’ll be well worth the money! Also you can get a pro to do it if you’ve got a bigger budget! Hope that helps! @Helen thank you very much for your vow love! I did in fact write them all by my self! I had invited Darren to make a contribution to them, but he thought they were prefect and didn’t want to change them just for the sake of it. So we both said the same thing to each other. That was my choice as I really wanted to make sure we were both making the same promises to each other. And thanks for your other lovely comments! @Alex Mrs M I’m glad you love our photos! They are pretty impressive, but then Dan is great! And of course I will be letting you and the rest of the girls know when I finally get myself up the duff!!! AND A MASSIVE YES to us all meeting up again!!! Maybe we could go dancing and I can do some of my groovy moves! @Sama thank you lovely! We are a bit silly really and I love it! @Rebecca thanks for the photo love! and I’m sure you newbies will raise the bar again! @Karen thank you very much lady! And yes I’m sure I could sort you out with a Real Bride discount! What do you want?? @Gabi CB I know I totally thought of friends when it happened, luckily I have no previous with Ross so all was well! As for the G&T bar there’s pictures of it on the Doris Loves facebook page! It was the welcome drink instead of champagne as neither Darren or I like the stuff and I recent the cost of it! So G&T was much cheaper! Everyone had it in Jam Jars with funny numbers on! It went down very well! @Victoria I’m glad we managed laughs as well as tears! That was what everyone said about my speech! @Adam I’m glad our video enticed you in for a full watch! @Charlotte thank you very much! It’s been a pleasure sharing all my creations! @Jenny Lane! Thank you much my dear! How kind! So that’s me then over and out! Loved part two Amanda. How is it that you and Darren always look so HAPPY???? Reception, BM outfits, DIY all immense. Muchos love. Amazing. You are. Yes. Congratulations again, lovely lady. And to Darren! LOVE this wedding !! The bride is gorgeous and the pictures are just perfect. Thanks for sharing !